Donald Trump plays golf at his course in Aberdeen. PRESIDENT DONALD TRUMP has come under criticism again for mocking Hillary Clinton by retweeting a doctored video that shows him smacking a golf ball in her direction. 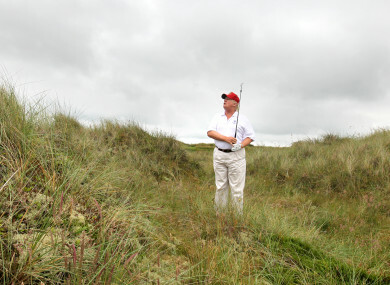 The first half of the short video shows the businessman – who owns several golf courses, including one in Doonbeg Co Clare – striking the ball in the air. In the next frame, the ball appears to hit Clinton in the back before she stumbles and falls down while boarding a plane. The footage of Clinton appears to be a doctored version of news footage from 2011 that shows the then-secretary of state falling after climbing the airplane stairs. The “deplorables” came back to haunt Hillary. They expressed their feelings loud and clear. She spent big money but, in the end, had no game! A spokesman for Clinton declined comment. The White House issued no immediate comment, and Trump aides have said in the past that his tweets “speak for themselves”. Republican Adam Schiff dismissed the tweet as “juvenile”. “It is distressing though to have a president that, frankly, will tweet and retweet things as juvenile as that,” Schiff said on ABC’s This Week. It doesn’t help, I think, in terms of his stature. It doesn’t help in terms of the stature of our whole country. DT RTs hitting HRC with golf ball. Getting really tired of begging GOP to get rid of this mentally ill disgrace. Not presidential or human. Trump has refocused his attention to Clinton since the Democratic presidential nominee re-emerged in the spotlight to promote her memoirs of the 2016 campaign. In What Happened, she assesses Trump as “a clear and present danger to the country and the world”. The White House has criticised the book, with spokeswoman Sarah Huckabee Sanders calling it “sad” that the last chapter of Clinton’s public life will be defined by selling books with “false and reckless attacks”. Back in July, Trump vented his rage against the media by posting a doctored anti-CNN video that showed Trump punching a man in a business suit and head covered by the CNN logo. - With reporting from AP. Email “Donald Trump shares 'juvenile' mock video of golf ball striking Hillary Clinton”. Feedback on “Donald Trump shares 'juvenile' mock video of golf ball striking Hillary Clinton”.